The return of winter! We would have published our report sooner, but were too busy playing out in all of that snow! 15.54″ of very low density snow fell last weekend, so we’ll round up to 16″ Add another 5″ and we are slowly moving away from the possibility of a Mad Max type drought next summer. Officially the Snotel site at Geyser Pass is at 47% before last nights snow. If you think that’s bad, Camp Jackson in the Abajos is reading 27%. LUNA members braved the deep ruts in the road Sunday to starting packing down all of the fresh stuff. They were able to roll the Gold Basin Trail and the Geyser Pass Trail up to the vault toilets up top. On Monday the Gold Basin Trail was widened and groomed and classic track was set to the end. Today, after the 5″ of snow last night, Gold Basin was rolled and groomed. The next grooming operations are scheduled for Saturday afternoon which will result in a smooth, but soft surface Sunday morning. A snowmobile lane has been established and it is helpful if activities that greatly disturb the smooth snow utilize the rougher side. The Geyser pass road is snowpacked and washboarded. A few ruts are evidence of folks dropping off the edge, so be wary when passing. 4wd is recommended. Well, still not enough snow fore any real turns. However, the skiing on the cross-country track is as good as it gets! It will take several more storms to allow for any sort real backcountry travel. A few grassy meadows will possibly allow for some low angle turns after the storm, but one should use extreme caution so as not to acquire a season ending injury by striking hidden rocks or timber. Be patient and check the Avalanche Forecast before you head up. Sadly, still no good news here for anyone looking to make turns in the La Sals. Wonderfully mild temperatures and sunshine in the forecast for the long term. Luckily there is still plenty of time to get enough Nordic touring skiing in this year. 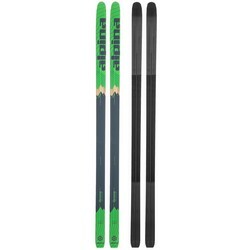 Alpina’s Discovery 68 skis are perfect for touring around the mountain on low angle packed and unpacked surfaces. Wide enough to break trail, skinny enough to get your glide on, and full metal edges with just enough side-cut to make your turns – or snowplows – easy and smooth. Icy hills turn into the bunny slope – no more terrifying run outs on plastic skinny skis. Pair them with either Rottefella BC NNN Magnum, NNN Auto, or 75mm 3 Pin bindings and choose from one of many new & used boots we have IN STOCK and see how far you can explore in a day! We offer free binding mounting with the purchase of skis, boots, and bindings! We process new gear and clothing everyday so stop in and see what’s new. or if you are too cozy in your jammies, you can view our new inventory HERE.